and Elders. 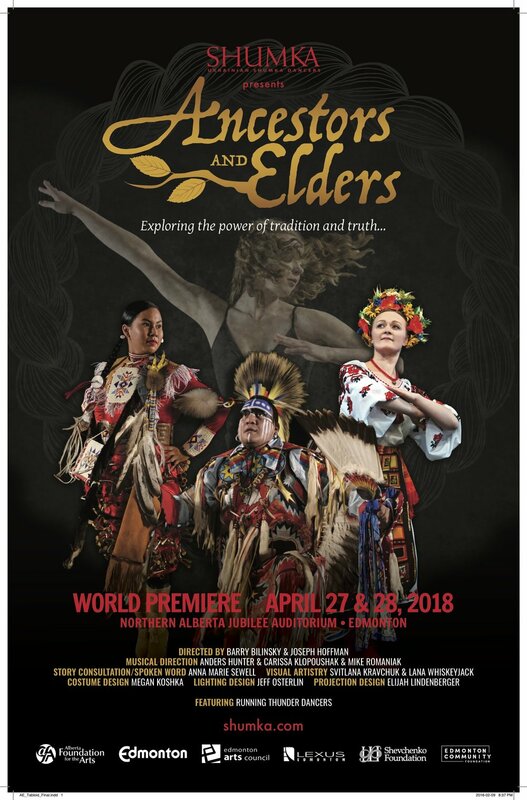 Ancestors and Elders features a cast of Shumka Dancers and multidisciplinary Indigenous artists. Together they share the story of the first Ukrainian newcomers to Canada, exploring the shared values and respected differences between these hopeful settlers and the First Nations people they encounter in a new land. The evening will feature visual art by Lana Whiskeyjack and Svitlana Kravchuk and discussion from members of the creative team. This exhibit by Svitlana Kravchuk and Lana Whiskeyjack is a selection of concept paintings and sketches for Shumka's upcoming world premiere of Ancestors and Elders. The pieces have been collaborated on by both artists, drawing from their experiences and cultural backgrounds. Through the creative process of Ancestors and Elders, Lana and Svitlana were able to explore strong personal and historical connections between their respective communities.